Autumn/Winter: Hibernation/Diapause - Newly hatched queen wasps hibernate over the winter months in preparation for the coming spring. Spring: Nest establishment - Queen wasps emerge from hibernation in the spring and find a location to establish a new nest. Summer: Egg laying, pupation and colony expansion - Once a nest becomes established, the queen will start laying eggs. Eggs hatch into larvae and grow. Once ready they pupate into adult wasps. Throughout the summer the nest will be expanded to make more cells for egg/larvae production. Late summer/Autumn: Queen production and mating - Before the dying process begins, the nest will produce new queens and males. New queens and males leave the nest and mate. Males die, and queens hibernate over winter. This process is how wasps reproduce year on year. Queen wasps spend all winter asleep in hibernation or to be more specific in a state of diapause. There are no worker wasps present during winter and early spring. Queens usually choose somewhere protected with a stable temperature to hibernate and can often be found in sheds, wood piles and lofts. They also nest underground in old rabbit burrows and mouse holes. 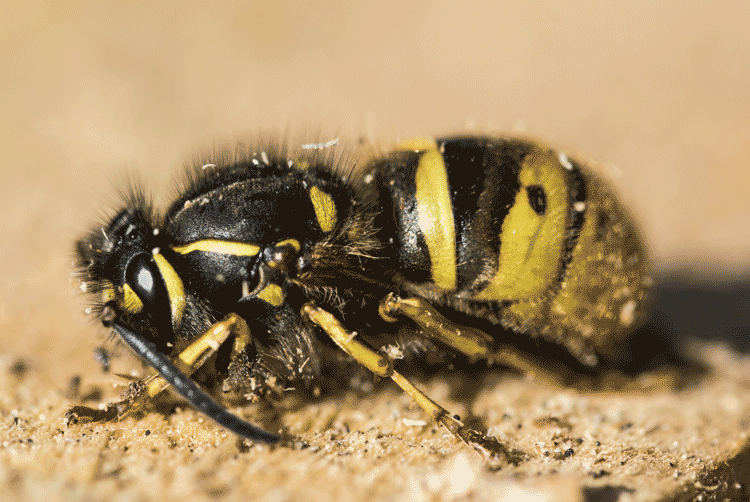 Colder winters tend to favour hibernating wasps. They stay in hibernation longer and do not emerge at the wrong time of year when there are no nectar-producing plants available as a food source. After waking from hibernation in spring, the first thing a queen wasp must do is feed. Adult wasps can only feed on liquid foods, typically nectar from flowers (Queen wasps and the first worker wasps of the season contribute to pollination as they top up on energy giving nectar). The following photo is a live queen wasp in hibernation. A single wasp, the queen, starts the construction of a wasp nest. The queen will choose a place to establish her nest, this can be anywhere, and on occasion, they build in the most unusual places. Typically loft spaces, sheds and holes in the ground (unused mouse/vole holes and old rabbit burrows) are common. She strips dead wood from fences, sheds or dead/dying trees and makes a paste from wood pulp by mixing saliva with the stripped wood, and she then uses this paste to construct her nest. Please take a look at the following video which illustrates a queen wasp collecting nesting material from a wooden post. 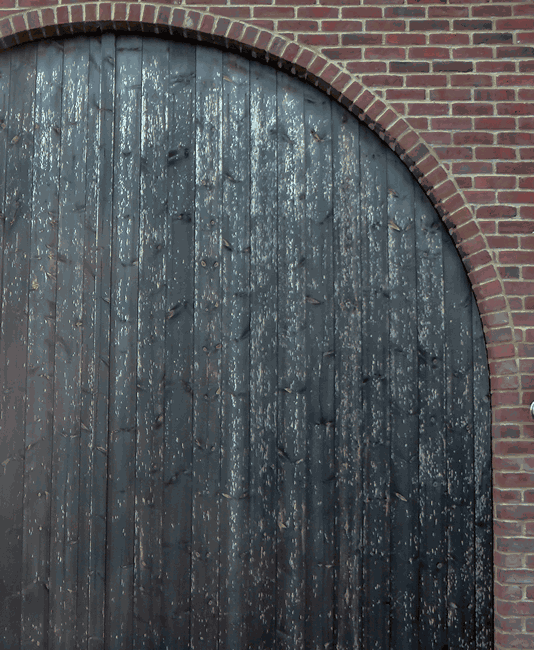 Sometimes it is noticeable where wasps have been stripping wood and they leave marks on the surface of fences and wooden doors. You can see a good example of this in the following photo. The queen starts the nest by creating a single cell at the end of a petiole (central stalk); six more cells are then added around this to create the hexagonal pattern of the comb. Once the first starter comb is constructed, the queen will lay eggs in each cell. She then starts to construct the outer shroud around the nest. As the nest grows, the combs expand, and more combs are added in layers. 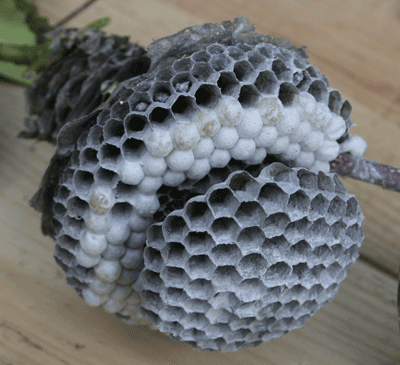 The inside view of a wasp nest (the outer shell has been removed). Once the eggs have hatched and gone through the larval stage, they pupate and emerge as adult worker wasps, taking over most of the day to day tasks of nest maintenance, foraging for food, brood care of young wasp larvae, nest building and water collection. Wasp larvae move in their cells causing the nest to make a noise. When a nest gets quite large, a crackling sound can be heard emanating from within. 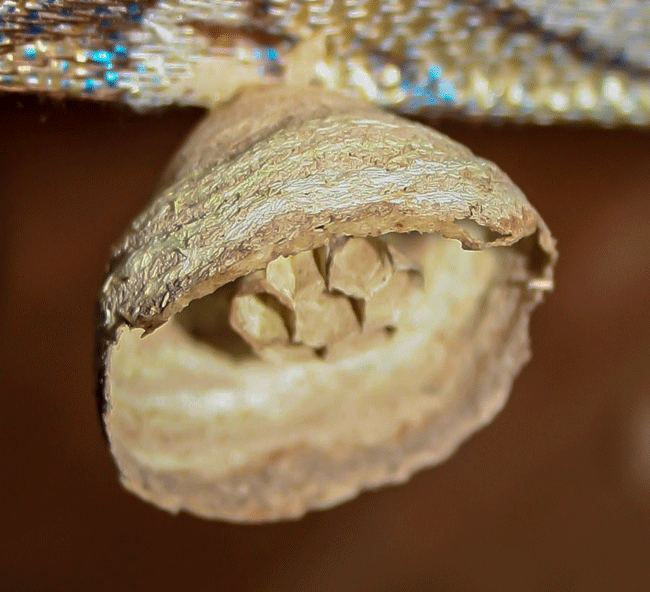 The following picture illustrates how the wasp larvae are contained within the brood cells, when they are ready to pupate they spin a silk cap over the top of the cell for their transformation into adult wasps. The following picture shows the different stages of the development of a wasp's life. The queen lays an egg, which grows into a small larva, the larvae then grow to full size and when ready it pupates into an adult worker wasp. The last image shows how the nest is layered, also in its proper orientation (cells pointing downwards). 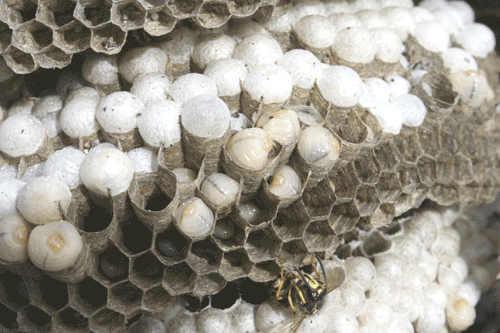 Each wasp nest or colony includes a single queen, the rest are sterile female worker wasps. Young wasps (larvae) are fed on insect prey (protein). You can watch our video of a worker wasp dissecting a honey bee which it will then carry back to its nest to feed larvae. 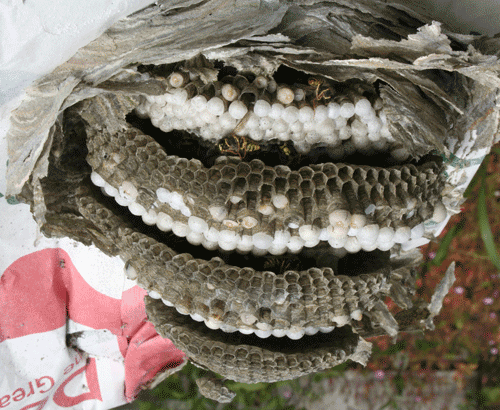 Temperature is critical in a wasp nest, too low and the larvae will chill, too hot, and the larvae will die from the heat. Wasps collect a lot of water in hot weather, which they spray into the nest to keep it at the right temperature. If the nest is touching a ceiling or wall, this can sometimes cause staining as the water soaks through. It is widely believed that wasps eat insects; this is not entirely the case. Adult wasps can only feed on nectar, sweet fruits or sugary liquids; they have no mouth parts that enable them to eat solid food such as insects. The adult's primary food source is a regurgitated form of sugar which they get from their larvae. Wasps have a peculiar (symbiotic) feeding system whereby adults feed insect prey to their larvae which turn the chitin (insect shells) into a sugary substance. This super energy drink is then fed back to the adults by the larvae (this is the same for common wasps, german wasps and hornets). Once a nest has produced new queens (the last batch of larvae) they switch to 'sweet feeding' (because there are no more larvae to feed, thus no more food is produced by the larvae) and wasps are often found harassing people in pub gardens later in the summer months. Once sweet feeding starts, the quality of the sugar in the wasp's diet drops considerably, and they are searching hard for enough energy producing food to keep flying, hence the annoying persistent harassment from them. Wasps do not get drunk from fermenting foods; they act drunk because they are starving and lack energy due to poor food sources. The end of the summer sees the production of the last batch of larvae; these are new queens and fertile male drones. Once they emerge from pupation, they leave the nest never to return. At this stage, there is no more food for the worker wasps or the original queen. They switch to "sweet feeding", and this is the time of year when wasps will hassle people in pub gardens e.t.c. Once all food sources have disappeared, worker wasps and the original queen starve. New queens and males are the sexual prodigies of the nest (not the workers). Once they have found their way outside, they will mate. After mating, male drones die, and the now fertile queens hibernate over the winter months ready to start a new nest and colony the following spring. The two most common types of "social wasp" found in the UK are the common wasp (Vespa Vulgaris) inhabiting much of the northern hemisphere. 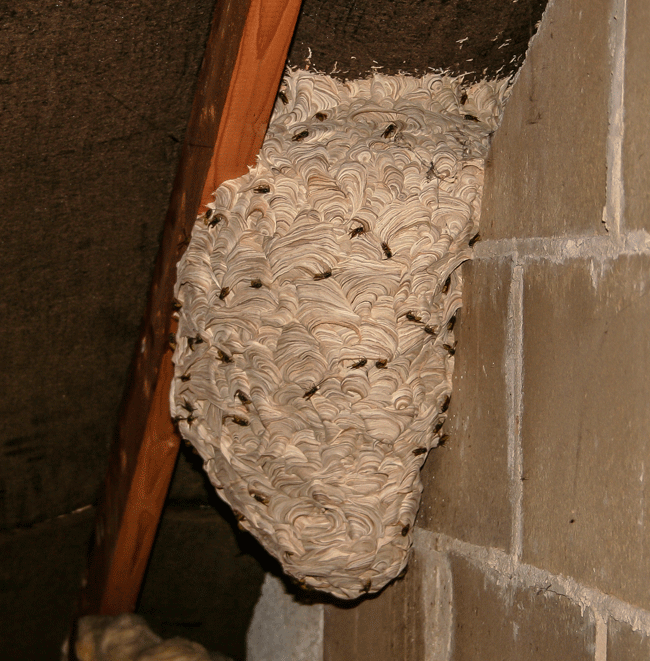 The common wasp nest is usually found in buildings, hollow trees, sheds, air bricks, behind tile hanging or just about anywhere that is dry. We have even seen them in old disused vehicles and underneath hot tubs. Often they take over a rabbit or rodent burrow and build their underground. The common wasp (nicknamed “Jaspers”) is about 17-20mm long. The second type of wasp commonly found in the UK is the German wasp (Vespula Germanica), also known as the "European Wasp". Despite some newspaper reports, they are not some new strain of 'Mutant Euro Wasp' that is going to take over the world. 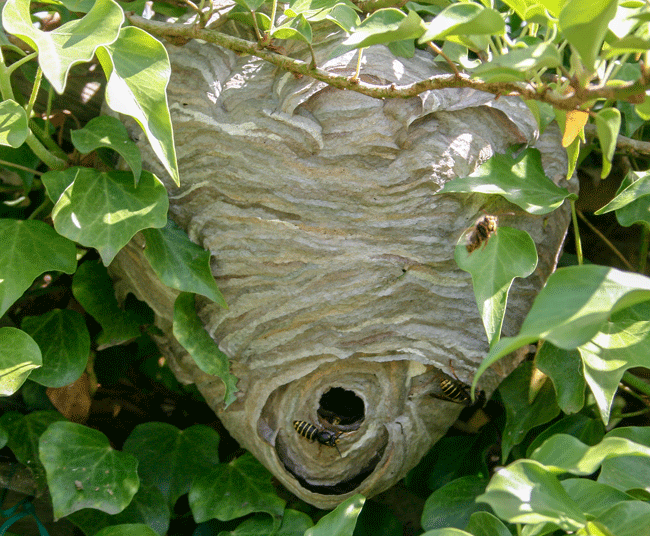 The 'German wasp nest' is built much the same way as the common wasp nest, but instead of constructing their nests underground or in buildings, the German wasp nest is generally found close to the ground in bushes and trees. 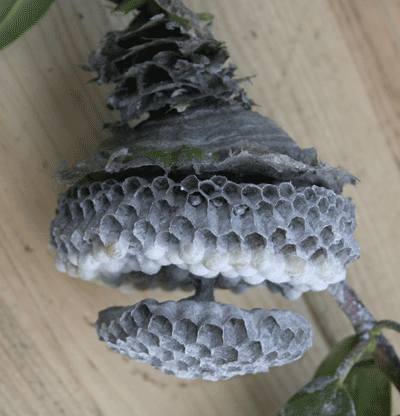 The nest structure is the same as the common wasp nest. The life cycle is the same as the common wasp, with one queen and sterile worker wasps taking care of daily duties such as nest building, repair and foraging for food. The European wasp is slightly larger than the common wasp and collects a variety of insects to feed its larvae. Median wasps, similar to common wasps are much less numerous. 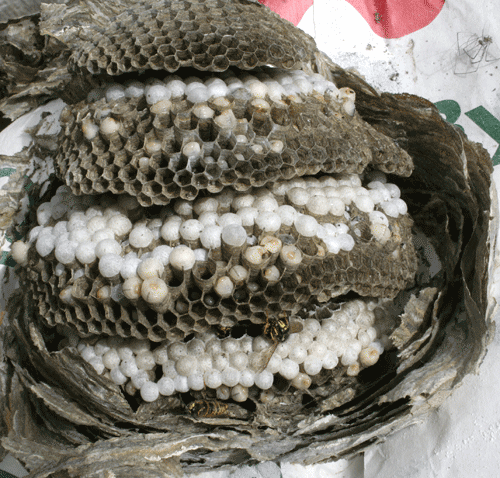 The nest looks similar to a common wasp nest but has a tube-like entrance at the bottom. Each wasp nest is unique, and numbers will vary depending on the time of year. Weather and food supply influence the population of wasps year on year. Common wasps can produce nests by the end of the summer (August/September) reaching a population of up to 5,000 or more occupants per nest. German wasps can produce nests that can hold up to 1000 individual wasps. 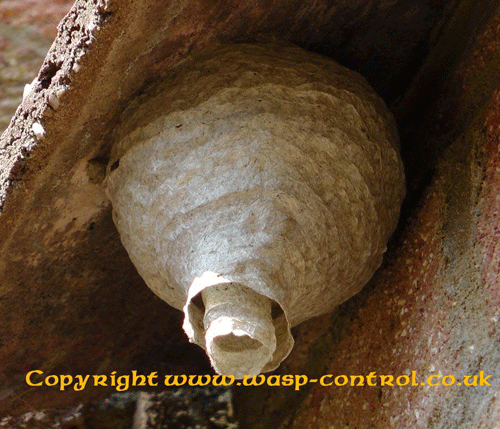 Please take a look at our page: how can I tell that I have a wasp nest?